Freja is one of my favorite models. I think that she has a great structure of face, it is very strong. And she also has an effortless style which amazes me so much. She made her debut as model in 2005. She is having contract with IMG agency right now. She has worked for many Fashion and Beauty brands,such as Burberry, Calvin Klein, Chanel, D&G, Hermes, Louis Vuitton, Miu Miu, and YSL. Freja has had a number of fashion items named after her, including the Jill Stuart Freja handbag, the Chloé Freja clutch, and the Alexander Wang Freja Lace-Up Stiletto Boot with Zip Detail. 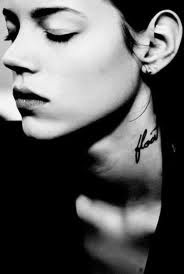 Freja known for her edgy, cool appearance, notably has 16 tattoos, the first of which she got at age 16. Her tattoos include "float", written on the left side of her neck, an upside down triangle on the back of her neck, a circle behind her right ear, a cross on her right earlobe, "Serendipity is Life" written on the back of her upper right arm, a revolver on the inside of her upper left arm, "This Too Shall Pass" written on the inside of her upper right arm, "This World Tonight is Mine" written on her right wrist, "Redemption" written on her upper left forearm, three circles on the inside of her left wrist, a star on her upper left torso (just under her armpit) and a lightning bolt her upper right torso. She has said that her tattoos do not affect her work and are easily concealed. Erichsen made a deal with her agent that she could have "as many tattoos as she wants" as long as she didn't cut her hair, although she did, in fact, cut her hair in 2007 after having established herself in the fashion industry. Anyway, Freja does smoke but she doens't drink. She likes soda a lot. Her favorite musician is PJ Harvey and some bands from Denmark, she is known for her love to her hometown. She is currently muse for Chanel designer and photographer, Karl Lagerfeld.